 Description: A highly collectable (and reliable) vintage pen with the most advanced filling system to date. Comparing and reviewing vintage pens can be a bit weird. The problem is the varying conditions an old pen can be in, repairs that have been done to the pen, and a vintage pen may not contain 100% original parts. This is more of a feature than a formal review, and keep in mind that your mileage may vary greatly when buying a vintage pen. That’s not to say that a great vintage pen can be purchased, and I really like both of my Snorkels. 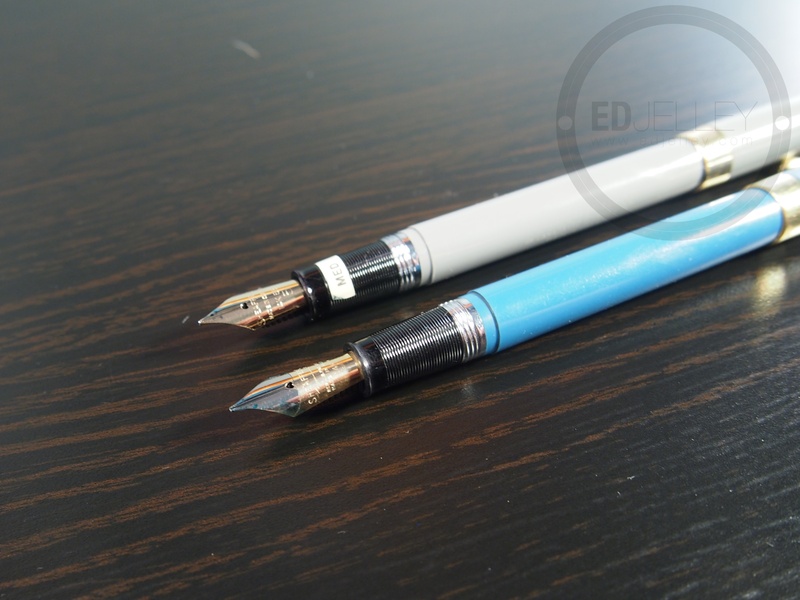 Onto the pens at hand… I currently have two Sheaffer Snorkels in my collection, a grey Admiral and blue Saratoga. The Admiral has a 14k gold nib, that is open-style. Some other models of the Snorkel come with a tubular nib (referred to as ‘closed’). The Saratoga model also has a 14k gold nib, but it’s two-toned; a feature which I really enjoy the aesthetics of. The Admiral is Canadian-made, and when I purchased it, it was pretty much in New-Old-Stock condition – still having the sticker denoting nib size on then grip of the pen. Both pens write exceptionally well and have a solid place in my rotation of pens. 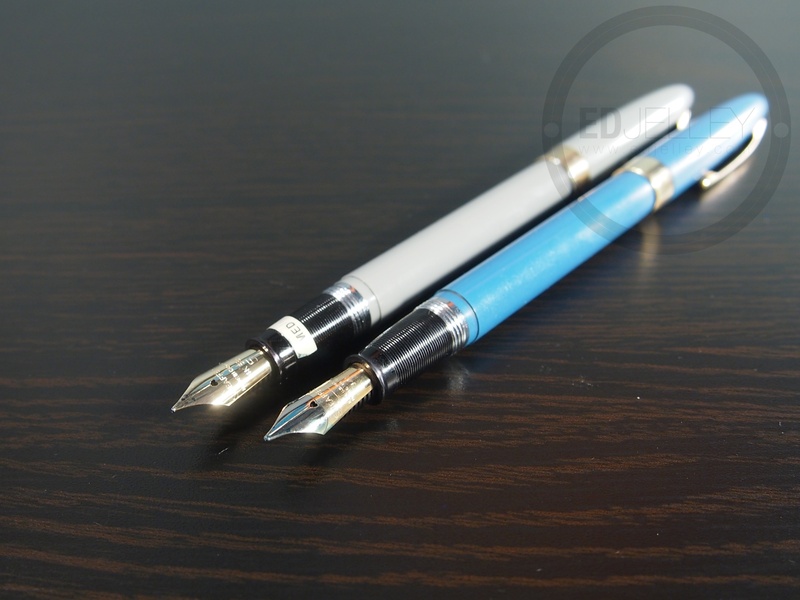 The Sheaffer Snorkels are on the thinner side, but still have some decent heft to them. 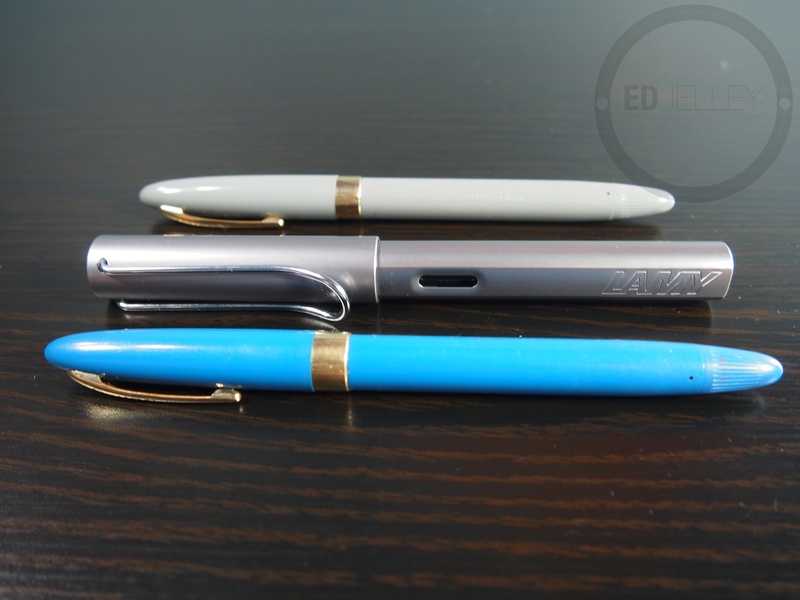 Compared to a Lamy Al-Star, they’re about the same length. When the pen is capped, it’s quite unassuming. The body is very plain, with a 1/4″ gold cap band. The only markings on the pen are the subtle stamping in the body stating the country of origin and the brand, and “Sheaffer’s” is stamped into the gold clip. 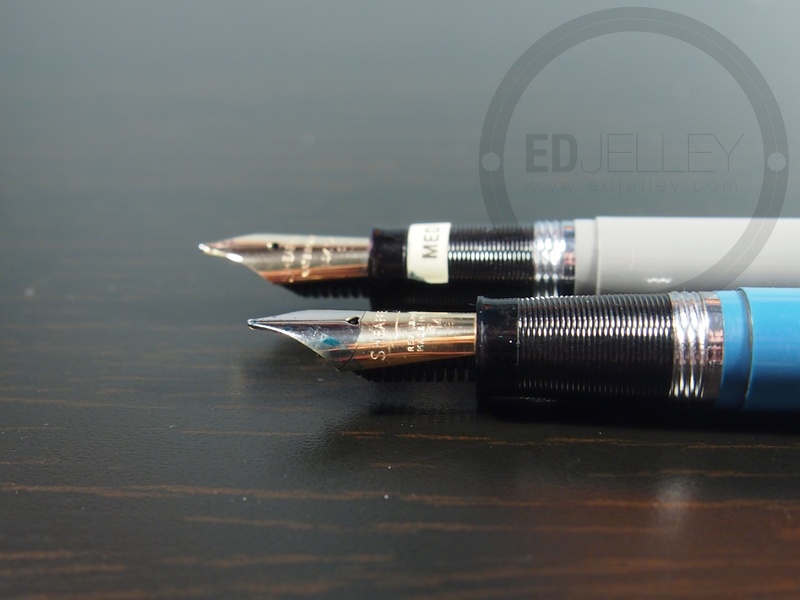 Later models have a white dot on the top of the clip, which Sheaffer used to denote their premium pens. The white dot was also used as a mark of quality. I really like the simple style of the Sheaffer Snorkels I have, knowing that under the plastic shell is the most mechanically-complex filling system to be in a fountain pen. The Sheaffer Snorkel is one of the most mechanically-complicated fountain pens, and has kept that honor for over 60 years. To fill the pen, you have to unscrew the tail cap, until the snorkel tube is fully extended from underneath the nib. Once fully extended, the tail cap is pulled out. 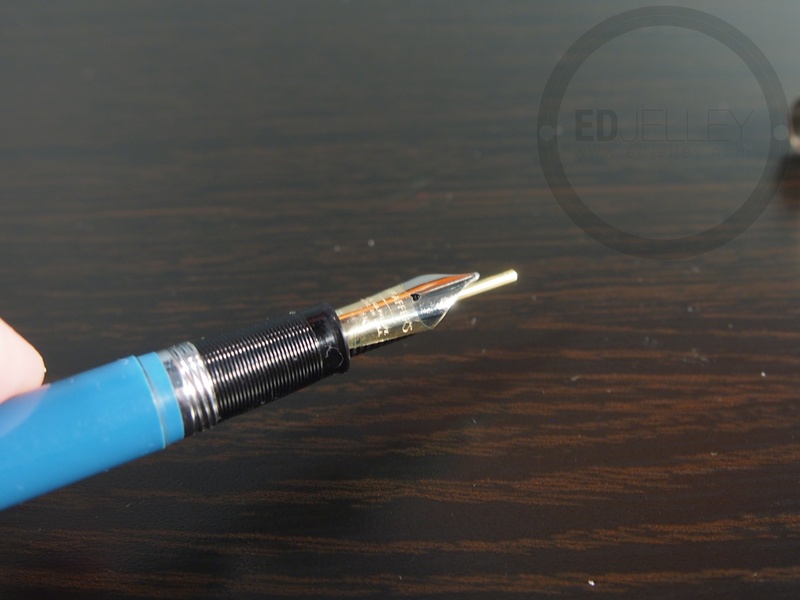 When the pen is “fully-extended” – you have to submerge the tube into the ink you wish to fill the pen with. It is not necessary to put the nib into the ink – making for a mess-free fill. When the tube is submerged, you must depress the tail cap back into the pen body. The internal sac is compressed with the downward motion, and when the tail cap is all the way back in the pen, the vacuum is released, sucking ink up through the snorkel tube and into the internal ink reservoir. After the pen is filled, the tail cap must be screwed back in, and the snorkel is retracted. It sounds very complicated, but it’s an easy and fun way to fill a fountain pen. The pen is long enough to write with comfortably when un-posted, but posting doesn’t throw off the balance or feel of the pen. The Sheaffer Snorkels are nicely weighted and well balanced. The grip on the models I have is ribbed for extra grip, and the metal flair at the bottom keeps ink off of your fingers. The transition between the grip and the section is smooth, and the threads are hard to notice when writing. 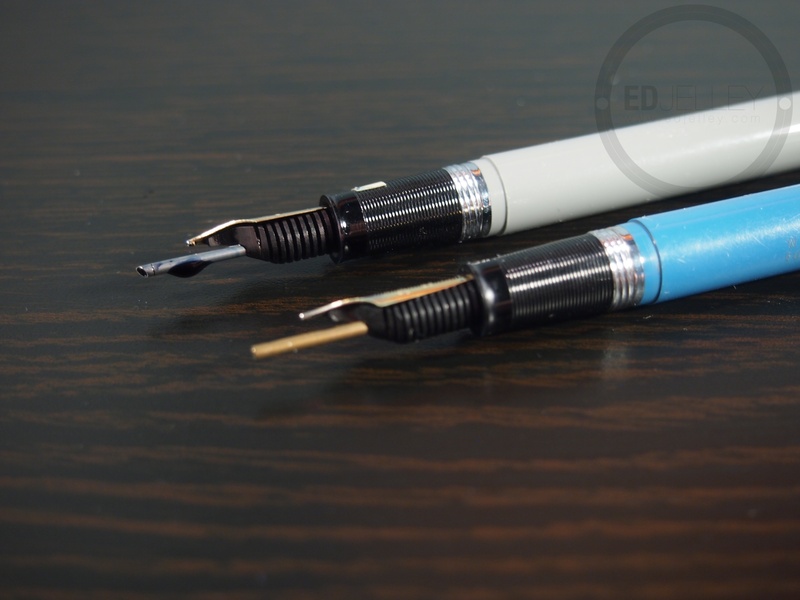 Both the Admiral and the Saratoga are identical in the body and cap, the only difference being the nib. 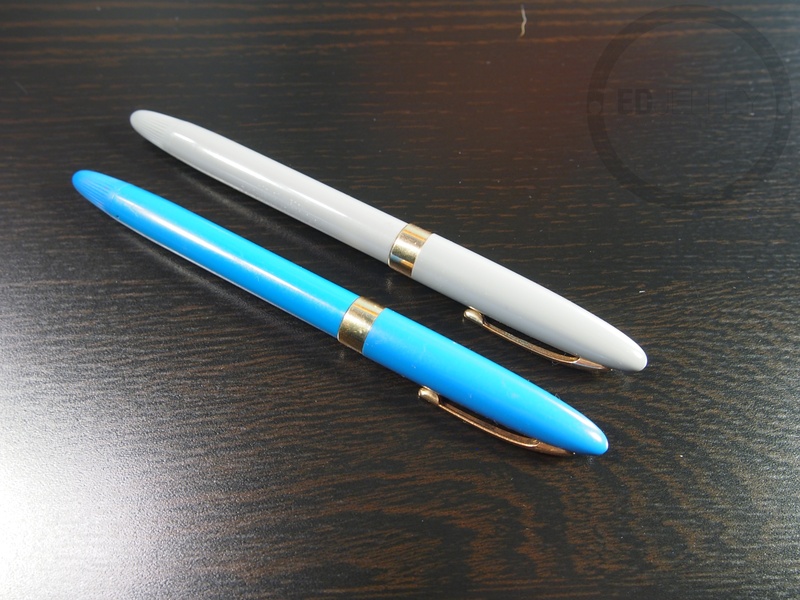 Both pens are comfortable and durable, although they are a bit slimmer than most modern fountain pens. Sheaffer made the snorkel fill models for around a decade, and they are by no means limited edition. It’s relatively easy to find a snorkel in great condition that has been professionally restored. There are several people and websites that do Snorkel restorations, most offering warranties on their work. 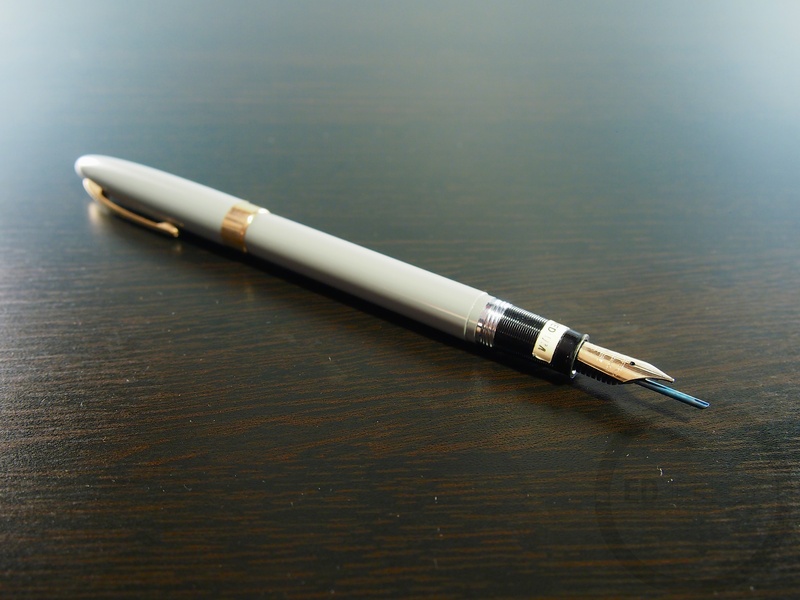 While not the cheapest entry into vintage pens (Esterbrooks can be had for surprisingly low prices), a user-grade pen in working condition can be found for around $60. 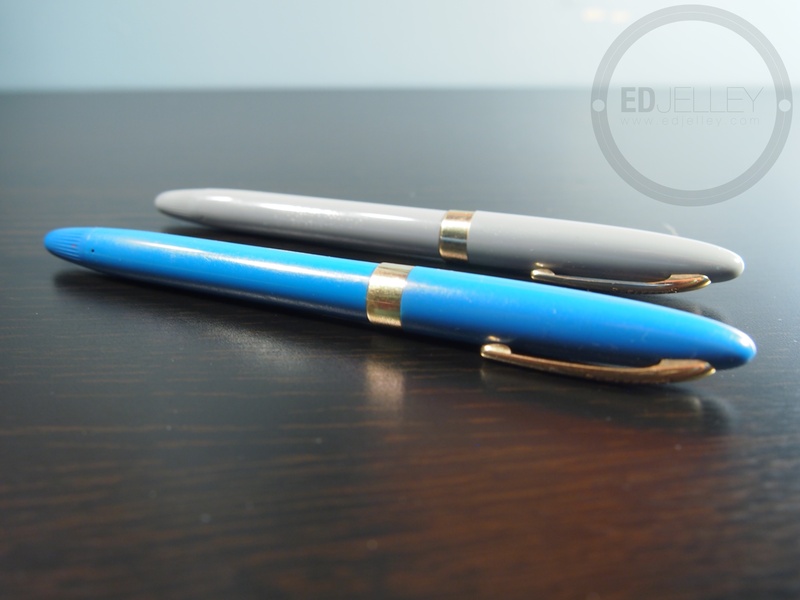 A fully restored, like-new pen and pencil set can be purchased for around $95, ready to write. AndersonPens.net offers restoration services and usually has a few nice models in stock. I’m by no means an expert on vintage pens, but I really like my two Sheaffer Snorkels. They’re great workhorse pens that come in a variety of body colors and nib types. Most of them have been in service for 60 years already, and I’m sure that if properly taken care of, they can easily go another 60 more. The filling system is really cool and fun to use as well. It’s definitely worth having a specimen of the Sheaffer Snorkel in your collection as a part of fountain pen history. I recently got my first snorkel filler, also an Saratoga, and love it. Thanks for reading! They’re great pens, even just playing with the filler mechanism is fun. Try the Sheaffer valiant or signature, they have triumph 2 tone nib, it’s much better than open nibs. I have 12 snorkels and I think the snorkels are really amazing. The Valiants look real nice, I just prefer the look of the open nib. Maybe someday! Your sheaffer saratoga is a First year pen, because it has a gold tube. Yes, it’s a 14k gold tube. After, they have stainless steel. Good to know, I’m no expert on the subject, so thanks for filling me in! I love to see some vintage pens! Those are fine examples. Thanks! This was a trial run for posting about vintage stuff for me. I’m happy with how it turned out, expect to see something on the Parker Vacumatic and the Eversharp Symphony in the future! Nice review! I adore all things Sheaffer, and I absolutely love the Snorkel for what it is. It’s an amazing pen, and so lovely to look at. I had difficulty with the threads being integrated into the grip section, though. I had a beautiful aqua/robin’s egg, like you have here. It was one of the first fountain pens that I acquired, but ended up selling mine as the threads made it too uncomfortable to hold. What a shame! The threads were pretty unobtrusive for me. The filling mechanism alone is more fun than most out there, and it makes it easily justifiable to keep more than one in the collection. Nice page! I’ll keep it in mind if I have any Sheaffer-related questions! Great post thank you. I love my snorkel pen also. Can you tell me as you rotate your different fountain pens as you write do you keep them all filled with ink, even if you may not use a particular pen for several months like a parker 51 for example . Any pen that I’m not using for more than 2 weeks will definitely get cleaned out for storage. It just makes it easier in the long run to keep a pen properly cleaned and maintained!